General search area: Once again….the hellish, deep canyon area westerly of Upper Covington Flat. The full rationale for interest in this area is explained by the writeup for JT67. This trip was to primarily finish the loop I had planned in JT68 but got stopped by the dry waterfall. If possible, I wanted to take a closer look in the area I found the Dollar Tree Store receipt, especially the northerly facing slopes. I was still also interested in finding a decent way in and out of this area. SPOILER: I didn’t. 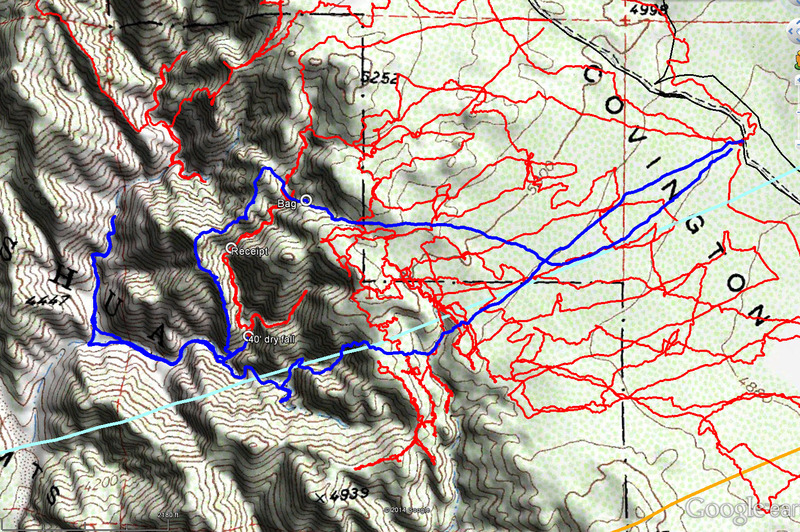 The terrain was reasonably nasty, on par with Smith Water Canyon, but better than my first two trips into the area. My descent route into the main wash at the canyon bottom was pretty steep in the upper areas. However upon reaching the main wash it was wide, very open and easy to travel through. I followed it northerly until almost joining up to the area I had explored on JT67. I didn’t go all the way as the temperature was rising and didn’t know what to expect from my planned, but untried exit route so I was more eager to turn back than to press forward. But the sense of isolation and remoteness to this area is really amazing. 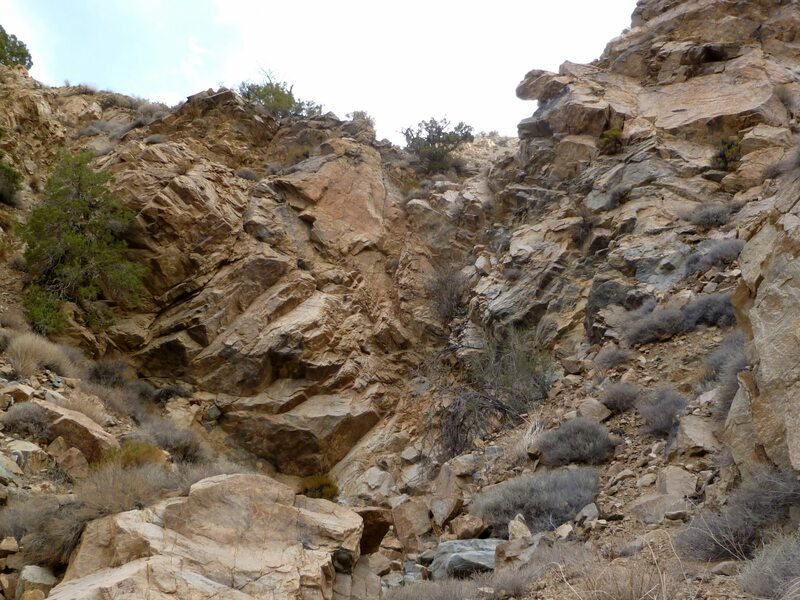 While exiting along the spine forming the northerly edge of the canyon in which I found the receipt in on my previous trip, I stopped several times to scan the opposite, northerly facing slopes with binoculars. It seemed to me that if the cell ping did arise from this area it would almost certainly have to be on a northerly facing slope (toward the Serin tower) and probably in the upper areas. A short distance upstream from the receipt area I spotted an orange colored object in a chute well above the canyon bottom, about 600′ away. Despite spending some time studying it, I couldn’t figure out what I was seeing. The odds would favor it being a Mylar balloon, but the coloring just didn’t look right for that. 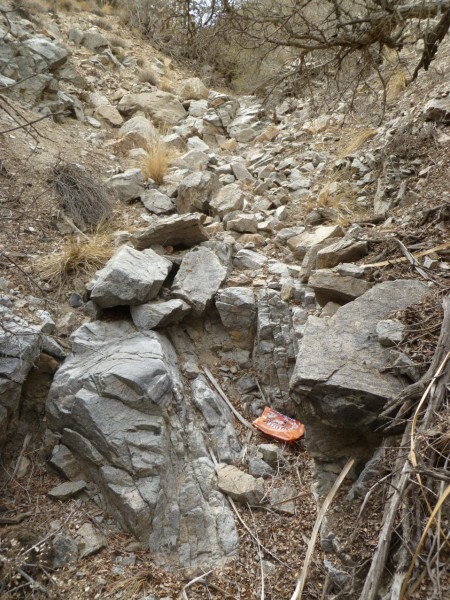 Reluctantly I decided to descend to the canyon bottom, then climb up the chute to investigate. I figured it was likely something interesting as this was a very remote and difficult area to get into. This place is just full of surprises. The following two pictures show what I found, the first picture showing it in place, before I disturbed it. Note that it appears neatly folded. 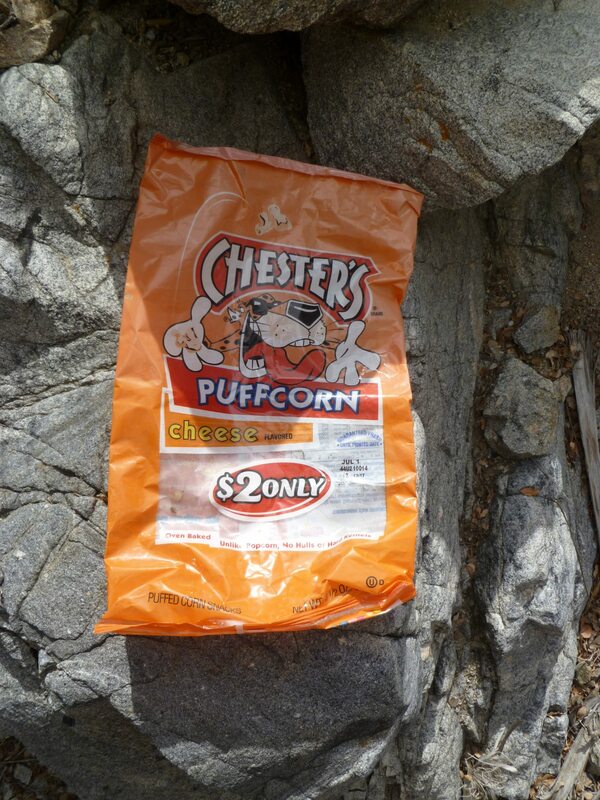 The Chester’s Puffcorn bag as first seen in context. Note it appears neatly folded. A closeup of the bag, now unfolded. The manufacturing code and freshness date are visible on the lower right portion of the bag. This is a Frito-Lay product. My immediate thought was it was somehow connected to the receipt located below and about 300 meters away. However it really didn’t show extensive weathering from being in the elements for a long period. I thought perhaps it was purchased at the Dollar Tree Store and the receipt might have been for that purpose. I continued up and out of the chute looking for anything further. Turned out it wasn’t such a bad exit route. The ridgeline I had been using was OK, but there was one 10 foot long segment where I had to straddle the spine like a horse, one leg on each side of the drop off, and inch forward across it. Um…Less than fun. So this chute was OK, despite failing to find anything further. Stopping at the Yucca Valley Dollar Tree Store on the way out I checked for the Chester’s Puffcorn product on their shelves. No luck with that particular item, but they had the Chester’s brand in some other similar snacks. I asked the staff there if they carried that specific item and they said they didn’t. Upon returning home I called the Frito-Lay consumer line and asked about the manufacturing date on the basis of the manufacturing code printed on the package. I was told it was definitely manufactured in 2014, so it’s apparently not a clue for Bill. Although the dating of the receipt remains a work in progress, it appears much more weathered an item and my hunch is there is not connection despite their odd proximity. Very good, including a lot of the northerly facing slope areas. While examining the bag’s brand at the Dollar Tree Store, I noted the freshness or “sell by” dates ranged from August to September of this year. Since the Chester’s bag I recovered has a freshness date of July 1, and manufactured this year, it suggests it was purchased in the May through June period. This means someone was out in this remote area, littering, during some of the hottest times of the year. This is very odd. It’s a very remote and unvisited part of the park. There’s no attraction for hikers, no peak, no water, it’s not pretty and no illicit pot plantations. Oh, and it’s damned dangerous. Finally, I had an informative cell phone experience. When I was up on the ridge spine and planning to change my exit plan, I decide to put in a call to Jeri to let her know I might be leaving the park later due to this. I normally wouldn’t have bothered, but I could see a large hunk of Palm Springs off in the distance and presumed I had fine cell coverage. Turning on my Verizon cell phone I found I had good coverage at 4 bars. It also pinged with a few inbound emails. So I was really surprised to find I could not get a call out. I called home repeatedly, but the call would never go through. It was just dead. So visibility of civilization off in the distance may not be a guarantee of a cell connection. The tracks for JT69 are shown in dark blue. Previous search tracks are in red, and the light blue line is the 10.6 mile radius from the Serin Drive cell tower. Locations of the bag, receipt and dry waterfall are also noted. Looking up towards the top of the dry waterfall that halted my JT67 trip. From below I still did not see an obvious, safe bypass to the drop. My final route was high to the left of the fall, up on the ridge spine.